The United States of America offers many kinds of legal forms for a number of events and activities. One among the many legal forms is a waiver of liability forms which is used for protecting a person or business from liability for risky activities. 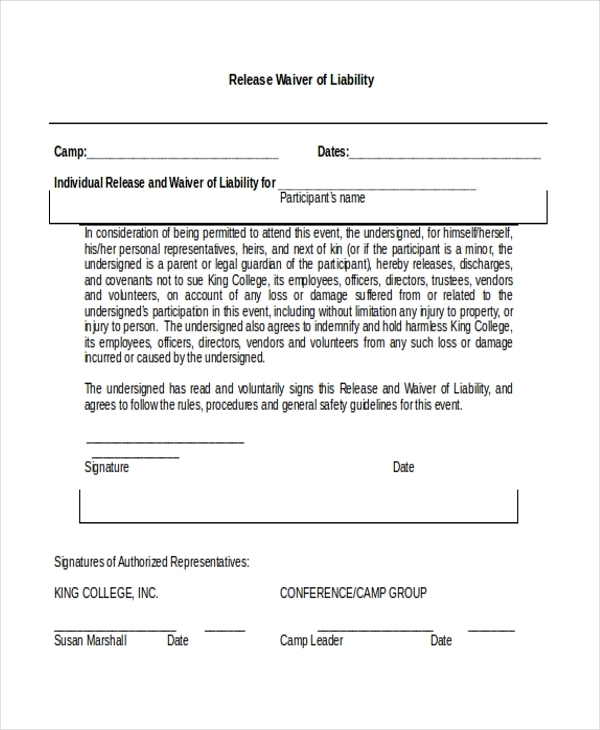 The participant has to sign the waiver of liability before participating in any activities. There are various types of Liability Forms. Some of them are a waiver of liability form, independent contractor liability waiver form, personal training liability waiver, waiver of liability agreement, accident liability waiver, and sports liability waiver, minor waiver of liability, waiver of liability consent form, volunteer project waiver of liability and waiver of liability release form. Waiver of liability form is a general form released by any government organizations, agencies or companies that are involving in a risky activity. This form is filled by individuals or body organizations who wish to participate in that activity under their own interest. 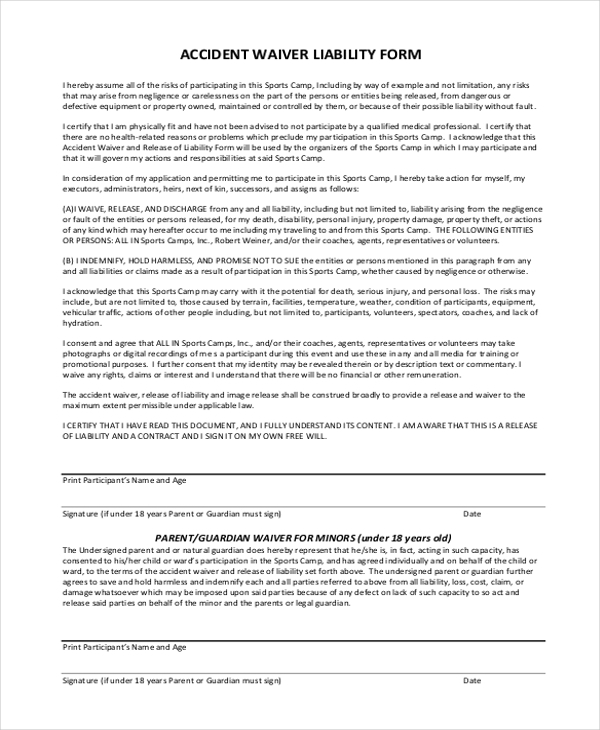 In this form, the releasing party does not intend to take any responsibilities of damage, injury, etc that the agreeing party might face during the activity. 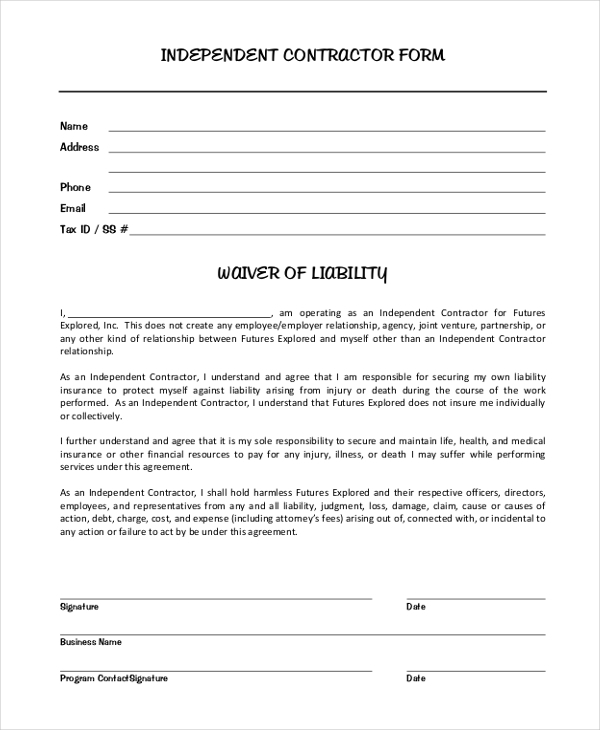 Independent contractor liability waiver form is filled and signed by a contractor who wishes to work for a company under his own interest and capacity without sharing any employee/employer relationship. Here, he declares that he is solely responsible for anything that happens in the duration of his commitment. You may also see General Liability Forms. 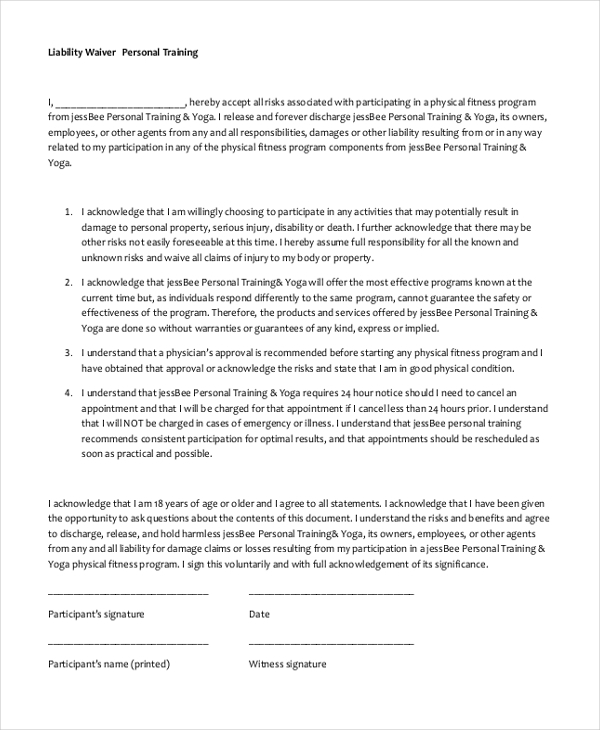 Personal training liability waiver form is signed by an individual who wishes to participate in any fitness competition like yoga competition and has taken training from any institute. Here the participant declares that the training institute is not responsible for any injuries caused during the event. He has to disclose his age and sign the form. Waiver of liability agreement is a general waiver of liability form. This form can be filled by anyone who wants to participate in any event or activity conducted by any organization. In this form, the participant is expected to sign and declare that he is solely responsible for whatever damage happens in the event and the conducting organization is not responsible for any act. You can also see Release of Liability Forms. Accident liability waiver form is usually filled by the people participating in any adventurous activities. Here, the participant signs the form that contains few declarations like he/she is merely responsible for any accidents that take place during the event and the team conducting the events are not responsible in any way. The parents or guardians need to sign on the behalf of minors. 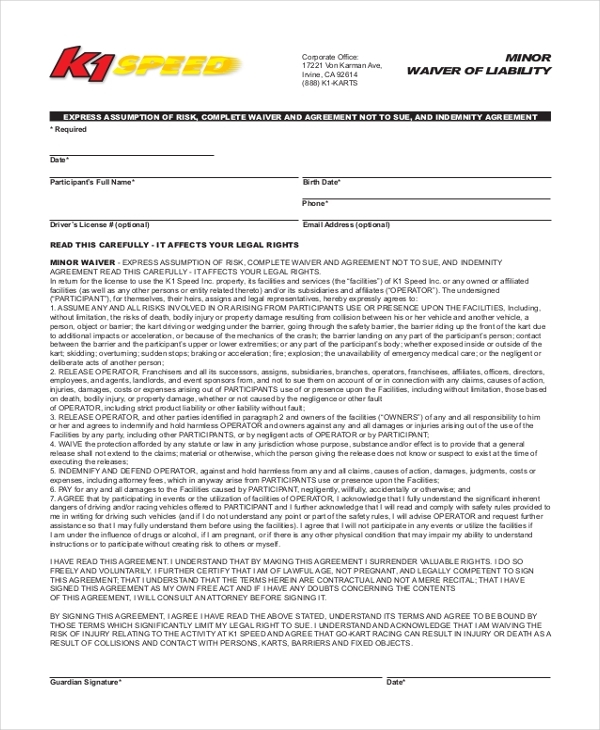 Sports liability waiver form is filled by individuals who want to participate in any kinds of events and activities related to sports. The individual self-declares that he is merely responsible for his act and safety. 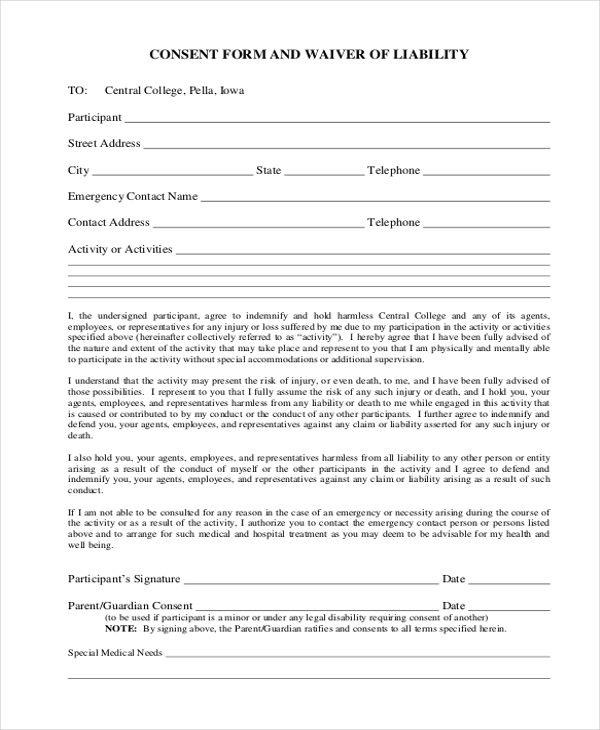 Minor waiver of liability form is filled and signed by the minor’s guardian or parent regarding any activities in which the minor’s participation is not encouraged until any agreement like this is signed. Here, the parent or the guardian declares that they are exclusively responsible for any act that would lead to dangerous consequences. Waiver of liability consent form is filled by an individual agreeing to the terms and conditions of a particular event. The individual has to show his/her consent to the agreement by signing the form. The terms and conditions are based on the liability to be borne if an individual participates in that activity. As the name suggests, volunteer project waiver of liability is filled by volunteers who want to participate in a project where the conductors of the project will not take any responsibility regarding few issues. 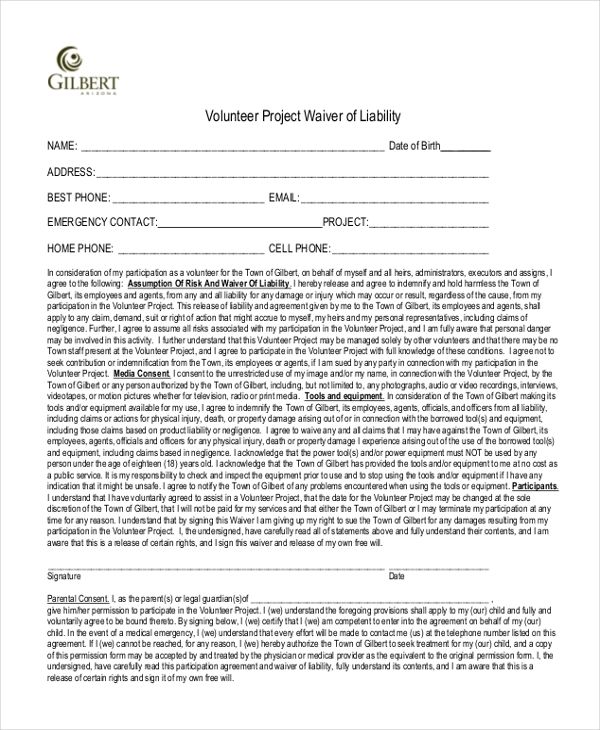 The volunteer is expected to sign this waiver of liability form in order to participate in the project. This form is signed by an individual who has got permission from the required authority to participate in an activity where the authority is not responsible for any loss suffered by that individual. The form is valid only when the individual, the authority which gave the permission for that individual to participate and the event or activity team signs and/or stamps the form. 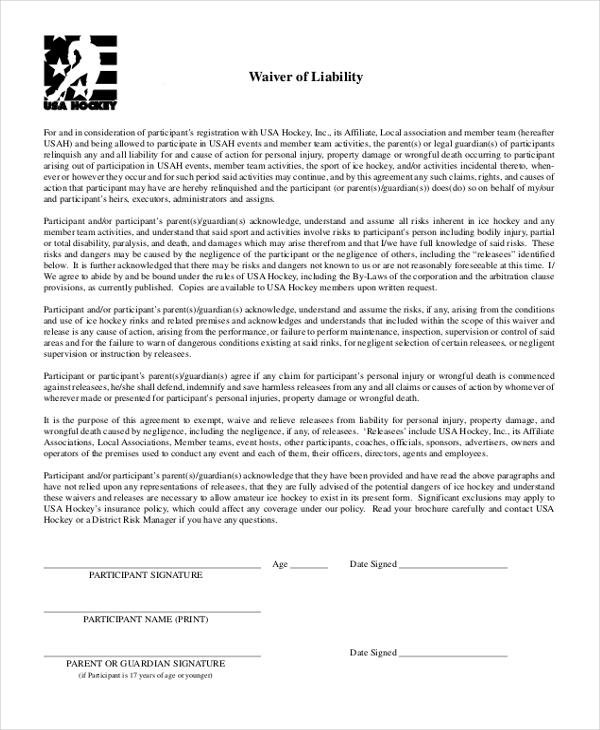 The waiver of liability form is filled and signed by an individual who wants to participate in a particular activity which is associated with many risks. In the case of the minor, his parents or guardian has to sign on behalf of him. Generally, the form is valuable for the institutions, organizations, agencies, or teams organizing and conducting the activities or events as the waiver of liability forms contains the consent of the individual agreeing to the terms and conditions regarding the risk. The form will not allow an individual to sue the organizers of the event or activity. Therefore, the target audience is the organizers of the event in the majority of the cases. What are The Benefits From the Waiver of Liability Forms? The waiver of liability forms plays an important role when any accidents or damages or injuries happen to any individual participating in any dangerous activities or events. 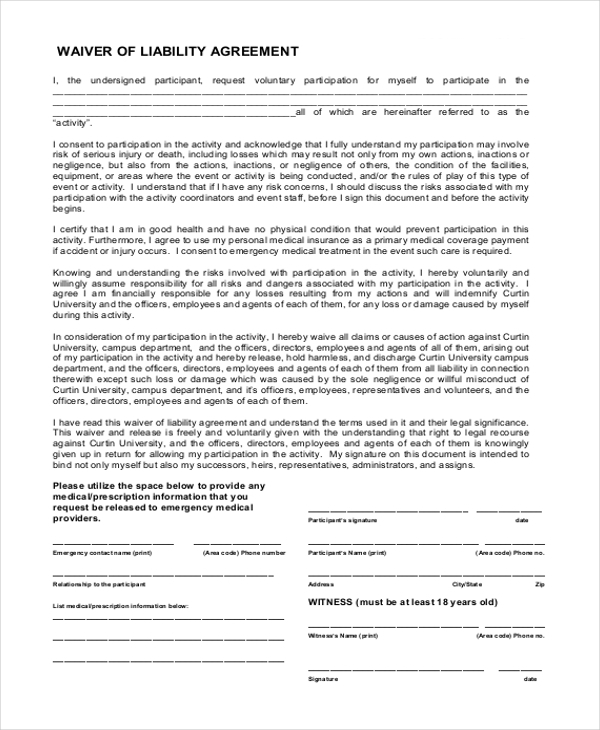 These forms are legally valid when the participant signs on the terms and conditions stated by the organizers regarding the risk associated with the participation. Also, these forms act as lifesavers when anything goes wrong in the event.You may also see Sample Liability Forms. The forms reflect an individual’s own interest and capacity to participate in the event. The organizers of the event can pass on the liability to the participants easily without giving any chance for the participant to sue them if any loss or damage occurs during the event. These forms purely act in the purpose of business and legality. It generally benefits the organizers of the event or activities.You can also see Liability Release Forms. To conclude, waiver of liability forms is extremely important for the organizations or individuals conducting any dangerous events or activities permitted by that particular country’s law. These forms help in solving any disputes cleanly. The participants should think twice before signing a waiver of liability forms. Overall, these forms are legally valid and should be used for right purposes.